Haywards Heath Town reached the semi-finals of the Peter Bentley Cup on Tuesday night with a 5-0 win over Eastbourne United. But people on social media and on an online forum do not believe they should have been in the competition. 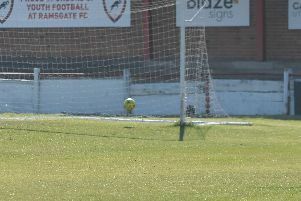 In an earlier round, when they beat Eastbourne Town on penalties, Shaun Saunders’ men brought on Kane Louis as a substitute, despite him not being named on the team sheet handed to the officials before the game. Haywards Heath have since been charged and fined for the error but remained in the competition. But Southern Combination Football League chairman Steve Nealgrove has clarified the situation and explained why Heath stayed in the competition. Nealgrove told us: “The Monday after the game was played, our registrations secretary was made aware of the incident. He then contacted the league secretary, who then turn contacted Mark Ives, head of judicial services at the FA for guidance. “In all cases where we are not 100% sure on the rule, we always contact the FA for guidance and their response was that it was not an on-the-field misdemeanour, it was an administrative error, therefore Haywards Heath should be charged with an incorrect teamsheet, but they did not play an ineligible player. The player was eligible to play regardless the fact he wasn’t on the teamsheet. “Eastbourne Town then put in a protest, I personally spoke to the secretary and spoke to him at length and explained the situation and told them if they wished to still go ahead with their protest it was their prerogative. Eastbourne Town still persisted and wanted to protest, and the SCFL again approached Mark Ives and he sent an email saying there are no third party appeals or protests against another club.We informed Eastbourne Town of this and we told them we would not be holding a meeting to hear the protest as directed by the FA. On Monday night, the league had a meeting with all the Premier Division clubs. The process is normally the senior assistant would check the names of the sub coming on against the teamsheet. Nealgrove said: “For reasons unknown, the player was allowed on the field. “Haywards Heath have accepted the charge and fine, which was £75. I can understand Eastbourne Town feeling a little bit aggrieved. “But, even though some people on social media might disagree, we follow the standardised rules that are handed down to steps 5 and 6 across the country. And Nealgrove had a message for anyone who wants to clarify a decision made by the SCFL. He said: “My phone number is in the handbook and on the webpage, I have always said to people, if you want to know something, phone me. If I know the answer I will answer it, if I don’t I will find out, but be aware it may not be the answer you want to hear.